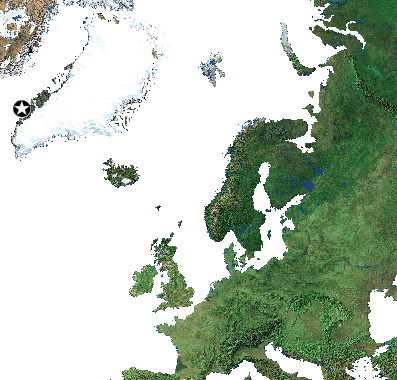 Europeans arrived to the world's largest island of Greenland in the 10th century. These were Vikings who established colonies here. They did not cope with the climate, however, as good as the native Inuit and in ca. 15th century the colonies perished. In 1721 the Danes tried again and founded a Lutheran mission at the location of the present capital of Greenland. This colony grew and the exploration of the island began. Deposits of many rare metallic elements were discovered and the world's largest deposits of cryolite were mined already in 1854. Developing trade with the motherland was monopolised by Danish kings, what made the island dependent on Denmark. The Danish Constitution of 1953 made Greenland a part of Denmark and Greenlanders became Danes. In 1979, Greenland gained autonomy within Denmark, which allowed abandoning the European Economic Community in 1985. The autonomy was extended in 2008 and the Greenlandic language (from Eskimo-Aleutian family of languages) was soon the only official language of Greenland. Greenland using the natural resources seeks slowly the independence.